Have you ever thought of joining a book club before, but not quite sure it’s for you? Well, I have to say that a book club can be for everyone and anyone. Truthfully, you don’t have to love books THAT much to enjoy yourself! Of course, the obvious reason to join a book club is a love of reading, but there are so many other wonderful opportunities you can look forward to when you join. Let’s talk book clubs, everyone! Do you ever find yourself reading a really good book and then you have no one to talk about it with? 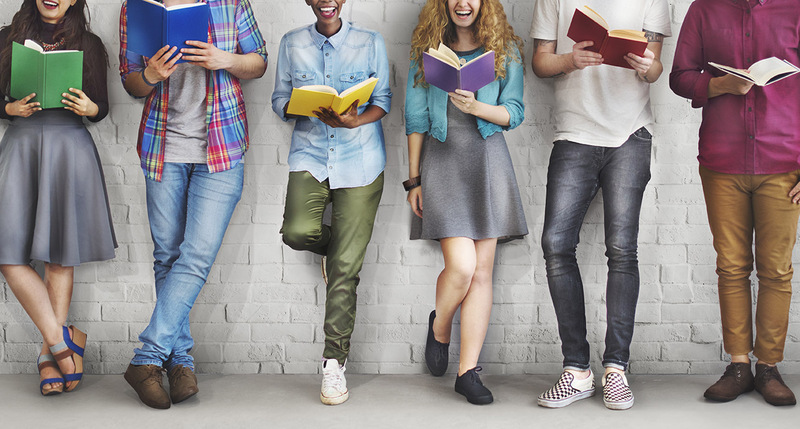 It can be difficult with the hustle and bustle of daily life to get your friends to read the book that you can’t stop raving about, but at book club you have 5+ people who are basically forced to read the same book as you. Another plus is after a few meetings you’re sure to bond over other things outside of book club and make some lifelong reading buddies. Some books are so dense and emotional they need to be discussed too. Book club is a lot about compromise. You may not always get to read the book that you had in mind, but that’s not necessarily a bad thing. If you are a diehard fan of mysteries and the group decides on a romance novel, you’ll get to read something new. You never would’ve picked out that book yourself, but you may find that you enjoy it way more than you thought you would. Believe me when I say that this happens more often than you might think! I like to think that we learn something new book with every book you read. It could be something as little as learning about a topic that was unfamiliar to you. Maybe it’s just a new vocabulary word. But if you’re lucky, you can learn a whole lot about other people’s lives, perspectives, and experiences. Best of all, talking through the book together means hearing wholly different points of view than your own. You can see the book in a new light! During book club, you discuss the book that you read with the other group members. This means a bit of public speaking (but not the nerve-racking kind!) and it gives you a chance to practice and conversational skills. Don’t worry, if you’re shy you don’t have to say anything. But after a good (or bad) book, we bet you’ll have a lot to say! The more you contribute to the conversation, the more likely you’ll feel comfortable. This is especially true once you get to know the other members after a few meetings. Book clubs are usually limited to a small number of people anyways, so you’re never directly put on the spot. If you’re looking for fun things to do in your spare time that doesn’t cost a lot, book club is THE place to be. It’s not too expensive to buy a book every month, and reading the book will take up a good amount of your time. You’ll be entertained for hours and you barely have to spend anything. It’s a win-win. Bookworms are usually seen in society as intelligent and bright. Always having interesting thoughts on books to talk about with your friends will definitely shine a positive light on you. The best reason to join a book club is getting to immerse yourself in a new book every month. And if you’re a reading procrastinator, you’ll have the incentive to finish your book. Did you know that we started a book club at Bookmans Flagstaff that you can join right now?! If you haven’t already signed up for our new Cafe Book Club at Bookmans, there’s still time to do so! Due to popular demand, we have 3 book clubs groups that meet once a month. Currently, our 1st Wednesday book club is full, but we are still taking sign-ups for the 1st Thursday and 3rd Tuesday! All book clubs meet from 6:30 pm – 8:00 pm and snacks and refreshments will always be provided. Best of all, you will get 25% off the book if purchased from our store. Not in Flagstaff? Every Bookmans location has a book club! The Mesa store has Banned Book Club. The Phoenix store has Backroom Book Club. The East store has a YA Book Club. The Northwest has Backroom Book Club. Midtown has 2 book clubs – the original Backroom Book Club and the New Adult Book Club. There’s a book club for everyone at Bookmans! Be sure to email bookclubs@bookmans.com to reserve your spot in any Bookmans book club!